The literal meaning of Ihram is to make haraam (forbidden). When a haji pronounces the Niyyah (intention) of Hajj and Umrah and utters Talbiyah, certain halaal(permissible) things become haraam for him. This combined action (Niyyah and Talbiyah) is called Ihram. The two sheets that a haji wears are figuratively known as Ihram but the real Ihram is Niyyah & Talbiyah. If someone wears these two sheets and does not declare his intention and utter Talbiyah, he does not become a Muhrim. That is why, before Niyyah and Talbiyah, he can cover his head during two rakahs of Nafl, an act which is not allowed in the real state of Ihram. Preparations for Ihram: Comb your hair, shape the beard, trim your mustache, cut your nails, and remove unwanted body hair. Internal purification, sincere repentance on your sins. Say something like this: "O Allah, I sincerely repent on my sins and seek your forgiveness." Ihram Sheets: Men should wear a sheet of white cloth around the waist and cover the upper body with the other sheet. Women's ordinary clothes are their Ihram. Both should wear the flip-flops (hawai chappal) so that the middle bones of the upper part of the feet are not covered. Nafl Salah: If it is not makruh (undesirable) time, offer two rakahs of nafl for Ihram by covering your heads. Intention and Talbiyah: Now uncover your head and declare your intention. It is assumed that you are performing Hajj al-Tammat'u in which Umrah is performed first as described later in the "Kinds of Hajj". "O Allah! I intend to perform Umrah. Please make it easy for me and accept it from me. Amen." Immediately after that utter the words of Talbiyah three times and as often afterwards as possible. If you don't remember it, you can say its translation in English or in any other language but Talbiah or its translation is pronounced in a loud voice by men and in a subdued voice by women. Du'a. After this recite Darud Sharif and supplicate to Allah Almighty any du'a in Arabic or in your own language. Journey towards Makkah. When this sacred journey towards Makkah al-Mukarrama starts, recite Talbiyah frequently on the way. Then enter the city very humbly and with great fondness still reciting Talbiyah.After arranging for your residence, proceed to the Haram Sharif to perform Umrah. This is the easiest way of performing Hajj as described below. This denotes entering into ihram for both Umrah and Hajj at the same time, not taking it off until the day of sacrifice at Mina. This means entering into ihram only for the Hajj and taking it off only on the day of sacrifice. Red color is the symbol of Fard the performance of which is imperative otherwise Hajj and Umrah will be invalid. Orange color is the symbol of Wajib the performance of which is obligatory otherwise Dam is required as a penalty. Green color stand for Sunnah or Mustahab (desirable). Try to perform these acts but no Dam is required if not done. Hajj Preparations The date 8 Zil Hijjah starts after the Maghrib prayer of 7 Zil Hijjah. Complete all the Hajj preparations during these night hours. Preparations for Ihram Comb your hair, shape the beard, trim your mustache, cut your nails, and remove unwanted body hair. Bath Take a bath with the intention of Ihram otherwise do wudu. Ihram Men should wear a sheet of white cloth around the waist and cover the upper body with the other sheet. Women's ordinary clothes are their Ihram. Both should wear the flip-flops (hawai chappal) so that the middle bones of the upper part of the feet are not covered. Nafl Salah If it is not makruh (undesirable) time, men offer two rakahs of nafl for Ihram in the Haram Sharif by covering their heads. Women can offer these nafls at home. "O Allah! I intend to perform Hajj. Please make it easy for me and accept it from me. Amen." Prohibitions of Ihram Now the prohibitions of Ihram start. Recall their detail and follow the rules. From this point on men cannot cover their heads for the duration of Ihram. Departure to Mina After the sunrise proceed towards Mina. On the way, pronounce Talbiyah as often as you can and also utter other supplications. But it is ok to follow the procedure of your Mu'allim who usually arranges for hajis to leave for Mina during the night after Isha prayers. In Mina In Mina offer Zuhar, Asr, Maghrib and Isha prayers. Spend that night in Mina and on 9 Zil Hijjah, offer Fajr prayer there. Departure for Arafat Offer Fajr prayer in Mina, say Takbir Tashriq (Allah-u Akbar, Allah-u Akbar La Ilaha ill-Allah wa-Allah-u Akbar, Allah-u Akbar wa Lillah-il-hamd) and Talbiyah. Get ready and reach Arafat by zawal (declining of the sun). Bath Take a bath, if possible, otherwise perform wudu and have meals. Packages of food are usually provided by the Mu'allim. Also take some rest. Waquf-e-Arafat Waquf is started at the beginning of zawal (declining of the sun) and ends at the sunset. Spend this time uttering Talbiyah, repent on your sins, seek forgiveness and mercy of Allah, say Darud Sharif and utter all the supplications (du'as) in Arabic and in your own language. It is better to do Waquf while standing but sitting down is also allowed. Zuhr and Asr Prayers In Masjid-e-Namrah, the imam leads Zuhr and Asr prayers, combined and shortened, at Zuhr time with one adhan but separate iqamahs. At other places in Arafat, some people similarly combine these two salats. But it is advisable that away from Masjid-e-Namrah, offer them at their proper times with jama'at as recommended by the most scholars. Departure for Muzdalifah When the sun sets in in Arafat, proceed to Muzdalifah without offering Maghrib prayer reciting Zikr and Talbiyah on the way. MaghribandIsha Prayers In Muzdalifah offer Maghrib and Isha prayers together at Isha time. For both prayers there is one adhan and one iqamah. Zikr and Du'a This is a very blessed night in which glorify Allah, recite Darud Sharif, read Quran, utter Talbiyah and supplicate very humbly. Also take some rest. Pebbles Pick up forty-nine pebbles of the size of big grams (chick peas) if Rami is to be performed for three days and seventy if for four days. Fajr Prayer and Waquf At the Fajr time after two rakah Sunnah, offer Fard prayer with jama'at. then perform waquf. Return to Mina Proceed to Mina when the sun is about to rise. Rami of Jamrah Aqabah In Mina, hit Jamrah Aqabah with seven pebbles one after the other. On account of risk to life, the old, weak or sick persons can perform Rami a little before sunset or at night. Stop Talbiyah Stop saying Talbiyah when you throw the first pebble. Also don't stop for du'a. Just go to your residence and do Qurbani (animal sacrifice). Qurbani (Animal Sacrifice) There are three days designated for qurbani, i.e., 10, 11 or 12 Zil Hijjah. It can be done any time during day or night. It is usually easy to sacrifice an animal on 11 Zil Hijjah. Do qurbani yourself or ask a reliable person to do it for you. Halq or Qasr After qurbani men should preferably get their whole head shaved (Halq) but it is permissible to cut the hair (Qasr) of their whole head equal in length to a joint of a finger (about an inch). It is also permissible to cut the hair (about an inch) of one fourth of the head. A woman is prohibited to shave her head. She can cut about an inch long hair of one fourth of her head. But according to some scholars it is sufficient for a woman to have a lock of her hair clipped. Tawaf-e-Ziarat Now perform Tawaf-e-Ziarat. It can be performed any time, day or night, from 10 Zil Hijjah to the sunset of 12 Zil Hijjah. Usually it is convenient to do it on 11 Zil Hijjah. Its procedure is similar to that of Tawaf of Umrah and it is essential that you have performed wudu. According to Sunnah this tawaf is to be performed after Rami, sacrifice and shaving or clipping of the hair, and every effort should be made to do that, but the Fard stands discharged even if Tawaf-e-Ziarat is performed prior to all these practices. As mentioned earlier, Halq or Qasr after Qurbani lifts all the prohibitions of Ihram but the private relations between man and wife are permitted only after this Tawaf. Return to Mina Return to Mina when Sa'ey is done and spend the night there. Rami of Jamrarat Throw seven pebbles on each of three Jamarat after zawal (decline of the sun). Rami is usually easy a little before sunset and at night. And it is permissible to do Rami at night if there is a risk to life. Supplicate Throw seven pebbles at Jamrah Oolah. Then move a little forward. And with your hands raised and facing Qibla, praise Allah and recite Arabic du'as or supplicate in your own words. There are no prescribed du'as. Supplicate After this throw seven pebbles at Jamrah Wustah. Here too facing Qiblah, praise Allah and earnestly seek his mercy and blessings. No particular du'a is prescribed here either. Do not supplicate Then throw seven pebbles on Jamrah Aqabah. But this time do not supplicate at all, after Rami just return to your place. of Ziarah If you could not do Tawaf-e-Ziarah yesterday, do it today and return to Mina for overnight stay. Zikr and Ibadah At your residence, recite Quran, glorify Allah, repent on your sins, and seek forgiveness. Ask Allah whatever you want and don't commit any sin. Supplicate After this throw seven pebbles at Jamrah Wustah. And facing Qiblah, glorify Allah, recite Darud Sharif and supplicate earnestly for whatever you desire. There is no du'a prescribed for this occassion. Do not supplicate Then throw seven pebbles on Jamrah Aqabah and come back to your residence without any du'a. of Ziarah If you could not do Tawaf-e-Ziarah earlier, it is essential to do it today before Maghrib. Option After today's Rami, you have the option to return to Makkah before sunset. But if the sun sets before you are able to depart, remain in Mina for the third night and throw pebbles the next day in the same order. Tawaf-e-Wida After Hajj, when you intend to return to your country from Makkah, it is Wajib (obligatory) to perform Tawaf-e-Wida (Farewell Tawaf). 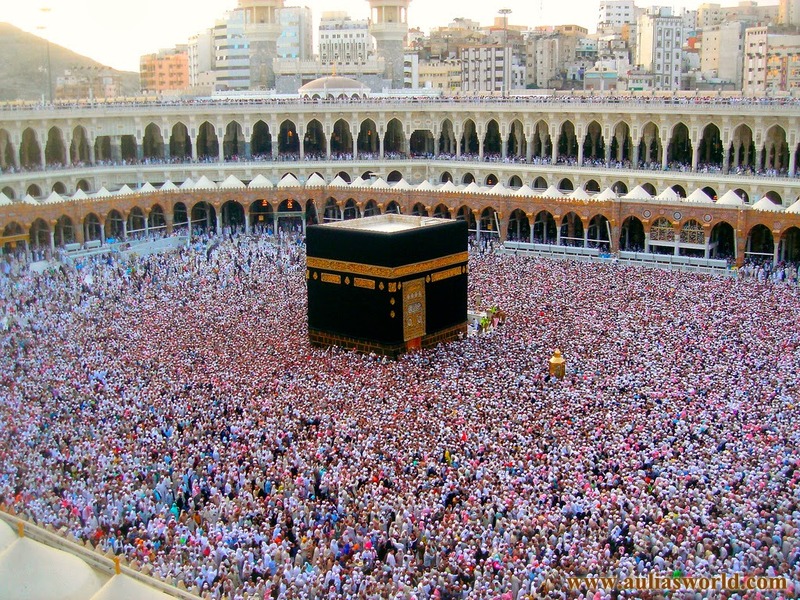 Its procedure is the same as that of a Nafl Tawaf. Magnificent View of The Prophet's Mosque To visit Madinah is not a Hajj or Umrah rite, but the unique merits of the Prophet’s city, his Mosque and his sacred tomb attract every pilgrim to visit it. There is no Ihram nor talbiyah for the visit to Madinah or the Prophet’s Mosque. 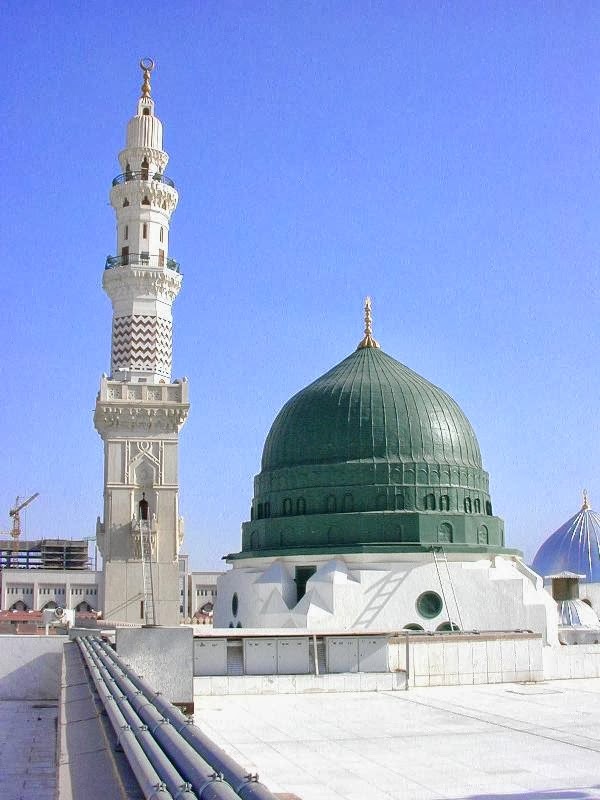 Unique Merit of the Prophet’s Mosque. The Prophet (peace be upon him) himself participated in the construction of this mosque, called it "My Mosque" and led prayers in it for years. He has also said that a salah performed in the Prophet’s Mosque is better than a thousand salats in any other place except Masjid al-Haram in Makkah. Masjid-e-Nabvi. After putting your luggage at your residence, take a bath or perform ablutions (vudu), wear nice dress, apply perfume and proceed towards the Prophet’s Mosque while uttering Darud. Bab-e-Jibril. Enter the mosque through Bab-e-Jibril or Bab-us-Salaam or if this is not possible, enter through any other door. Two Raka’t Nafl. If it is not undesirable (Makrooh) time, offer two rakahs of nafl tahiyyat al-masjid (greeting of the masjid) preferably in Riaz al-Jannah near the tomb of the Prophet or otherwise anywhere else in the mosque. In front of the Holy Tomb. In front of the sacred tomb of The Holy Prophet (peace be upon him), there are three sections of brass screens and all three have holes in them. Look at the picture carefully. If you stand in front of the middle section between the pillars, you'll see a big round hole on your left. This is in front of the face of the Holy Prophet. Adjacent to it is a door that stays closed. Right after it on the right side is a round hole which is in front of the face of Hadrat Abu Bakr Siddique. On the right of it, there is another round hole which is in front of the face of Hadrat Umar Farooq. Salam on Hazrat Abu Bakr Siddique. Then move a little to the right and stand before the grave of Hazrat Abu Bakr (may Allah be pleased with him). Greet him and supplicate to bestow His mercy and forgiveness on him. Salam on Hazrat Umar Farooq. Again move a little to the right before the grave of Hazrat Umar ( may Allah be pleased with him), and greet him and make supplication for him. Forty Prayers. Men should offer forty prayers (Salat) in the Prophet's Mosque, but it is not a requirement of any kind. It is only Mustahab, i.e., rewarding if done, but if not done there is no sin. martyrs of Uhud (may Allah be pleased with them) and Masjid Qiblatain, etc.Among them Masjid Quba is the most important. 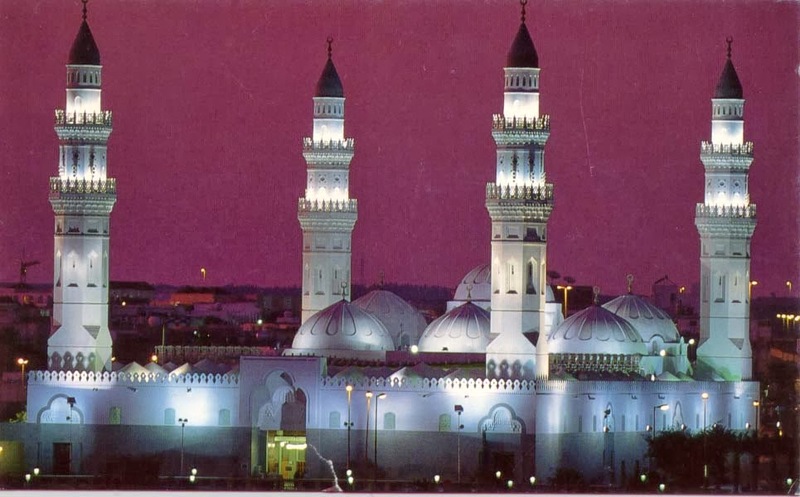 It is the first mosque in the history of Islam whose foundation stone was laid down by Prophet Muhammad (peace be upon him) himself on his migration to Madinah. To offer 2 raka'ats of nafl in it is equal to one Umrah. After visiting the Prophet’s Mosque and his tomb every pilgrim should try his best to visit it and pray in this mosque as well. Departure from Madinah. When you have to leave Madinah, offer your Salam again to the Prophet (peace be upon him), cry at this separation, supplicate to Allah and leave with the earnest desire to come back. To zabh (slaughter) a specific animal in the days of Nahr is Qurbani. Hadith 11: Sayeduna Abdullah Ibn Umar (Radi Allahu anhu) narrates that the Beloved Prophet (Swall Allahu alaihi wasallam) said, “I have been ordered for the Yaumul Adha (The Day of Adha), Allah has made this day an Eid for the ummat. A man asked, “Ya Rasool Allah, tell me if I have no animal besides a maneeha, so can I do Qurbani with it? That is, whoever does not have the means to do Qurbani will get the reward for Qurbani by doing these things. And the owned possessions are more than the hajate asalia [explaned in Masala 2]. Masala 26: Four arteries are to be cut whilst slaughtering. If three of the four arteries are cut or most of the each four arteries are cut then the slaughterd is Halal.